The latest available data from the Justice Department show that during August 2016 the government reported 468 new white collar crime prosecutions. According to the case-by-case information analyzed by the Transactional Records Access Clearinghouse (TRAC), this number is up 23.2 percent over the previous month. This report summarizes the government's recent efforts when it comes to combating white collar crime — the number of such cases, the investigative agencies involved, the laws cited, the busiest federal districts and the busiest federal judges. The comparisons of the number of defendants charged with white collar crime-related offenses are based on case-by-case information obtained by TRAC under the Freedom of Information Act from the Executive Office for United States Attorneys (see Table 1). When monthly 2016 prosecutions of this type are compared with those of the same period in the previous year, the number of filings was down (-11.1%). Prosecutions over the past year are still much lower than they were five years ago. Overall, the data show that prosecutions of this type are down 43.6 percent from levels reported in 2011. The decrease from the levels five years ago in white collar crime prosecutions for these matters is shown more clearly in Figure 1. The vertical bars in Figure 1 represent the number of white collar crime prosecutions of this type recorded on a month-to-month basis. Where a prosecution was initially filed in U.S. Magistrate Court and then transferred to the U.S. District Court, the magistrate filing date was used since this provides an earlier indicator of actual trends. The superimposed line on the bars plots the six-month moving average so that natural fluctuations are smoothed out. The one and five-year rates of change in Table 1 and in the sections that follow are all based upon this six-month moving average. To view trends year-by-year rather than month-by-month, see TRAC's annual report series for a broader picture. Within the broad category of white collar crime, cases were classified by prosecutors into more specific types. 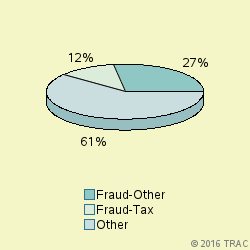 The largest number of prosecutions of these matters in August 2016 was for "Fraud-Other", accounting for 27.4 percent of prosecutions. Prosecutions were also filed for "Fraud-Tax" (12%), "Fraud-Federal Program" (10%), "Fraud-Health Care" (8.8%), "Fraud-Financial Institution" (8.5%), "Fraud-Identity Theft-Aggravated" (6.8%), "Fraud-Identity Theft-Other" (6.8%), "Fraud-Other Business" (5.1%), "Fraud-Other Investment" (3.6%). See Figure 2. The lead investigative agency for white collar crime prosecutions in August 2016 was FBI accounting for 22 percent of prosecutions referred. 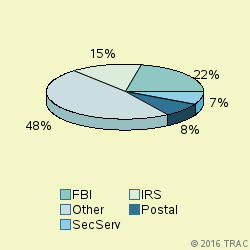 Other agencies with substantial numbers of white collar crime referrals were: IRS (15% ), Postal (8%), SecServ (7%). See Figure 3. In August 2016, 60 defendants in white collar crime cases for these matters were filed in U.S. Magistrate Courts. These courts handle less serious misdemeanor cases, including what are called "petty offenses." In addition, complaints are sometimes filed in the magistrate courts before an indictment or information is entered. In these cases, the matter starts in the magistrate courts and later moves to the district court where subsequent proceedings take place. In the magistrate courts in August the most frequently cited lead charge was Title 18 U.S.C Section 1029 involving "Fraud and related activity - access devices". This was the lead charge for 18.3 percent of all magistrate filings in August. Other frequently prosecuted lead charges include: "18 USC 1028A - Aggravated Identity Theft" (15%), "18 USC 1343 - Fraud by wire, radio, or television" (10%), "18 USC 1028 - Fraud and related activity - id documents" (8.3%). In August 2016, 408 defendants in new cases for these matters were charged in the U.S. District Courts. In addition during August there were an additional 35 defendants whose cases moved from the magistrate courts to the U.S. district courts after an indictment or information was filed. The sections which follow cover both sets of cases and therefore cover all matters filed in district court during August. Table 2 shows the top lead charges recorded in the prosecutions of white collar crime matters filed in U.S. District Court during August 2016. "Fraud by wire, radio, or television" (Title 18 U.S.C Section 1343) was the most frequent recorded lead charge. "Fraud by wire, radio, or television" (Title 18 U.S.C Section 1343) was ranked 1 a year ago, while it was ranked 4 five years ago. Ranked 2nd in frequency was the lead charge "RICO - prohibited activities" under Title 18 U.S.C Section 1962. Ranked 3rd was "Fraud and related activity - access devices" under Title 18 U.S.C Section 1029. "Fraud and related activity - access devices" under Title 18 U.S.C Section 1029 was ranked 2 a year ago, while it was ranked 8 five years ago. Among these top ten lead charges, the one showing the greatest increase in prosecutions — up 860 percent — compared to one year ago was Title 18 U.S.C Section 1962 that involves " RICO - prohibited activities ". Compared to five years ago, the largest increase — 20.1 percent — was registered for prosecutions under " Fraud and related activity - access devices " (Title 18 U.S.C Section 1029 ). Again among the top ten lead charges, the one showing the sharpest decline in prosecutions compared to one year ago — down 31.3 percent — was " Fraud and False statements " (Title 26 U.S.C Section 7206 ). Compared to five years ago, the most significant decline in prosecutions — 71.7 percent — was for filings where the lead charge was " Mail Fraud - Frauds and swindles " (Title 18 U.S.C Section 1341 ). In August 2016 the Justice Department said the government brought 165.4 white collar crime prosecutions for every ten million people in the United States. Understandably, there is great variation in the per capita number of white collar crime prosecutions that are filed in each of the nation's ninety-four federal judicial districts. The districts registering the largest number of prosecutions per capita for these matters last month are shown in Table 3. Districts must have at least 5 white collar crime prosecutions to receive a ranking. The Southern District of New York (Manhattan) — with 1783 prosecutions as compared with 165.4 prosecutions per ten million population in the United States — was the most active during August 2016. The Southern District of New York (Manhattan) was ranked 2 a year ago, while it was ranked 7 for most frequent use five years ago. The Eastern District of Missouri (St. Louis) ranked 2nd. The Eastern District of Missouri (St. Louis) was ranked 5 a year ago. Western District of Tennessee (Memphis) is now ranking 3rd. Recent entrants to the top 10 list were Western District of North Carolina (Asheville), now ranked 6th , and Utah at 7th In the same order, these districts ranked 21st and 34th one year ago and 27th and 40th five years ago. The federal judicial district which showed the greatest growth in the rate of white collar crime prosecutions compared to one year ago — 105.9 percent — was Northern District of Indiana (South Bend). Compared to five years ago, the district with the largest growth — 89.5 percent — was Southern District of New York (Manhattan). In the last year, the judicial District Court recording the largest drop in the rate of white collar crime prosecutions — 34.6 percent — was Western District of Virginia (Roanoke). But over the past five years, Western District of Oklahoma (Oklahoma City) showed the largest drop — 66.7 percent. At any one time, there are about 680 federal District Court judges working in the United States. The judges recorded with the largest number of new white collar crime crime cases of this type during August 2016 are shown in Table 4. A total of 9 out of the "top ten" judges were in districts which were in the top ten with the largest number of white collar crime filings per capita, while the remaining 1 judges were from other districts. Judge Richard Joseph Sullivan in the Southern District of New York (Manhattan) ranked 1st with 46 defendants in white collar crime cases. Judge Paul R. Cherry in the Northern District of Indiana (South Bend) ranked 2nd with 11 defendants in white collar crime cases. Judges John Andrew Ross in the Eastern District of Missouri (St. Louis), Max Oliver Cogburn, Jr. in the Western District of North Carolina (Asheville) and Naomi Reice Buchwald in the Southern District of New York (Manhattan) ranked 3rd with 6 defendants in white collar crime cases.